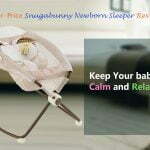 When it comes to baby diapering, two options which are Disposable Diapers and Cloth Diapers.And between this types of cloth diaper, the cloth diaper is a reusable piece of fabric made from natural fibers, man-made materials or a combination of both so wraps around your baby’s crotch and ready to contain poop and pee. Cloth diapers are a very effective poop catching solution. When soiled, simply wash the cloth diaper and reuse it.There are many benefits of cloth diapers using. LBB Baby pocket diapers are the cloth diaper extremely easy to use and are highly recommended by new mothers. The Reusable Baby Cloth Pocket Diapers from LLB diaper brand contains 6 inserts and ensures greater comfort for your growing baby. The outside cover is waterproof and breathable. The triple row of snaps on the front of the diaper make it possible to fit any sized baby like small (8-15 lbs. ), medium (12-25 lbs. ), or large (20-35 lbs.). These have been made of waterproof, anti-leak and breathable TPU to ensure optimal comfort for baby. Polyurethane keeps peep and urine inside and protects water from outside. 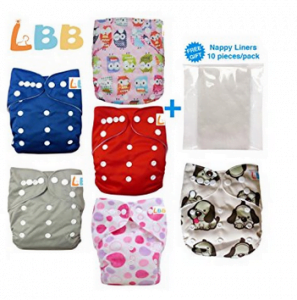 LBB Baby Cloth Pocket Diapers come with the entire package of 6 pieces of diapers along with 6 inserts. The diapers contain more comfortable material and have a strong absorbency power which keeps baby healthy and happy. 3 rows of adjustable snaps in this reusable cloth diapers give a specialty for fitting with any size to baby’s waist. This means that small to large sizes of waists can be accommodated in a single diaper. The presence of an additional row of snaps ensures a better fit for little baby. 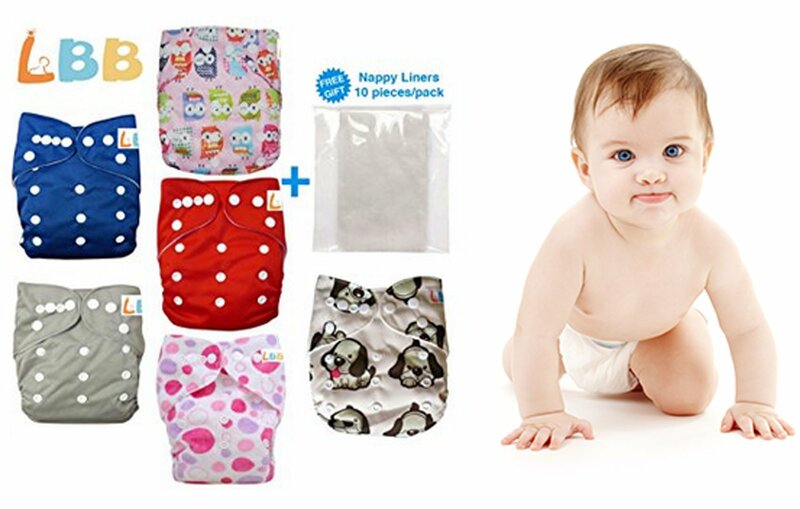 LBB Reusable Baby Cloth Pocket Diapers is washable and thus become a reusable diaper.The diaper can be washed at a fewer temperature than 30 ° C or 86 ° F. And you need to keep in mind that the diapers should not be washed along with other clothes. The insert and the diaper cover should wash separately. While washing the diapers it is also recommended to add salt to the water. This Pocket Diaper has a leak-proof exterior and waterproof system. The easy way used diaper has waist tab to overlap extra small size waists. Used TPU (Thermoplastic Polyurethane) keeps the poop and pee inside and does not allow water to come in. They are cost-effective.Until another bundle of joy (baby) comes you won’t have to spend money for diapers again because of adjustable snaps. It is more absorbent and healthy. This is for both baby boys and girls. The adjustable snap of this Baby Cloth Pocket Diaper gives a chance to fit with your any sized baby’s waist. Waist tab overlaps for extra small waist size. As the inserts can changeable so it has fewer chances of skin infections and it is anti-bacterial due to the diaper covers and top-quality inserts. Some mothers complained that the LBB Reusable Baby Cloth Pocket Diapers tend to leak a bit around the legs. However, this problem can easily overcome by adjusting the snaps in a fitting manner and use inserts in the center of a position of the leg area. Few users have experienced that the provided space to stuff is little congested to insert inside the diaper.But such drawbacks are observed by very few users and are avoidable altogether. Question: Can I use the insert directly on my baby’s skin with the shell? Answer: Microfiber should never go against the skin, so if your inserts are microfiber, just stuff them in the pockets, all other inserts are ok against the skin. Question: What is the size of the reusable cloth diapers? Answer: 12.9 x 8.4 x 3.4 inches is the size. So, think before choosing for baby. And weight recommendation is 8-35 Pounds. Question: Are the 6 inserts nappies are reusable? Answer: The 6 inserts of diapers are reusable. They are actually really absorbent. And the mixing of a little salt in water is suggested during washing. Question: What fabric is used to make the insert these diapers? Answer: The insert they come with is microfibers. Question: Where is come from? 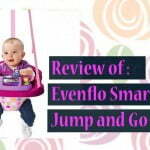 Most of the parents who have purchased and used the product for their little ones only have good things to say about the diapers. When considered from all aspects, the LBB Reusable Baby Cloth Pocket Diapers proves to be a great, environment-friendly, comfortable, reasonable price and thus save money due to the fact that they are not disposable in form and can be used over and over again.